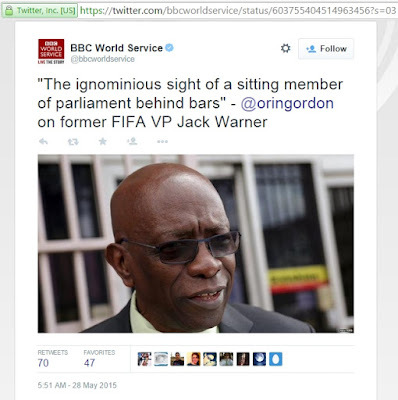 We know as much (or little) about the explosive scandals at FIFA as anyone else who relies on open-source information. What has caused to stay tuned to developments at "the world’s most powerful and loathed sports organization" is not so much the "beautiful game" as the repulsive role played in FIFA's affairs by one of the world's major funders of Islamist terror [see "30-Jul-14: Is Qatar's stupendous wealth connected with Hamas' ongoing terrorism?"]. And as we have written here dozens of times during the past decade, we remain astonished (and appalled) at how one of the world's most influential sources of news and analysis gives a distorted, understanding, even empathetic, platform for the dissemination of the terrorism-friendly views [for instance, "01-Apr-15: A question for Jeremy Bowen and his morally-challenged BBC handlers"] espoused by Hamas and by its principal funder. Thus our feelings, as we look at the news of a massive unfolding criminal investigation ["US indicts 14 over ‘rampant’ FIFA corruption", Financial Times, yesterday] are probably more narrowly focused than those of others. That's why we post below links to two reports focused on just one of the senior FIFA figures now in the hands of police. Naturally, like all the other men arrested yesterday or about to be brought into custody, he is entitled to his day in court and the presumption of innocence. Trinadadian Warner says in a letter to the Trinidad Guardian, which will be published in full on Tuesday, he intends to speak out on the affair and highlighted who he felt was to blame for his downfall. "I will talk about the Zionism, which probably is the most important reason why this acrid attack on Bin Hammam and me was mounted," Warner told the newspaper. 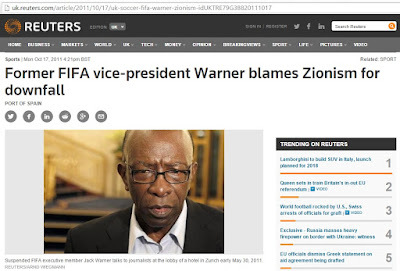 This week's BBC reporting on the FIFA man's "downfall" makes no mention of Zionism ("the national movement for the return of the Jewish people to their homeland and the resumption of Jewish sovereignty in the Land of Israel"). Nor, as far as we can see, has Reuters (or any other mainstream news source) taken the opportunity to follow up that 2011 story by putting Warner's ignominious accusations against Zionism (!) into the context of the vast money-and-influence-buying scandal unfolding this week. Perhaps they should. Then again, sports and news reporting, like history, are no longer what they used to be, and probably never will be again.